These treats smelled soooo good! Ridiculously good. I almost convinced hubby to taste one. :) I probably would have myself to be honest, but being vegetarian I'm not into eating gelatin. I liked working with pumpkin in gelatin for our Pumpkin Spice Latte Gummies, and decided to play around with a fancy variation to create a special pumpkin pie inspired gummy. The results? Doggone droolworthy! You can scale volumes to suit your mold or pans - see tips below. These treats could be easily adapted to combine everything into a single mixture instead of layering if you'd prefer a quicker simpler treat recipe. The dogs don't care about these things - only us crazy people. Hehe. Optional seasonings: Sprinkle of ground ginger, and/or Ceylon cinnamon. I used around 1/2 tsp of each. You can use more or less of the spices/seasonings if you wish to alter the supplementation content or smell/taste of the gummies, or something omit completely to better suit your dog. Optional: 1 tbsp honey (I used Manuka - it has a great strong scent and is a healthy honey). Starting with the pumpkin layer, measure the water into a small saucepan. Sprinkle the surface with gelatin powder and let sit for approximately five minutes or longer for the gelatin powder to bloom/gel. While that's happening, you can prep the pumpkin by pureeing cooked pumpkin with the additional water and optional spices, then set aside. Gently stir the mixture over low heat until the gelatin is completely dissolved. Take care not to shortcut with high temperatures or overheat, as this can reduce the setting strength of your gelatin. Remove from heat, add pumpkin puree mixture, and pour into silicone molds (shaped gummies) or a glass pan (cut and slice). Chill until just barely firm to the touch (fully set layers don't bond well), then add the next layer. While the pumpkin layer is setting, prepare the crust layer. Sprinkle the surface of the cold water with gelatin powder and let sit for approximately five minutes for the gelatin powder to bloom/gel. Once your gelatin is bloomed and ready, gently stir the bloomed gelatin mixture over low heat until the gelatin is completely dissolved. Remove from heat, and add the oats and honey. Note: For a clear distinction between layers, the pie crust mixture should be warm (still fluid) but not hot (may melt into the pumpkin layer below). Gently spoon/pour over your touch-firm pumpkin layer. Chill to set thoroughly. Spicing thing up? Don't be tempted to use a ready-made pumpkin pie spice mix in dog treats instead of individual add-ins. Most contain ingredients that are not suitable for dogs, such as nutmeg. Although small amounts are unlikely to cause harm, its better to avoid the risk. Just made these earlier today and my pup loved them. He wasn't sure at first and treated it more like a toy until he got a taste and happily gobbled it down. 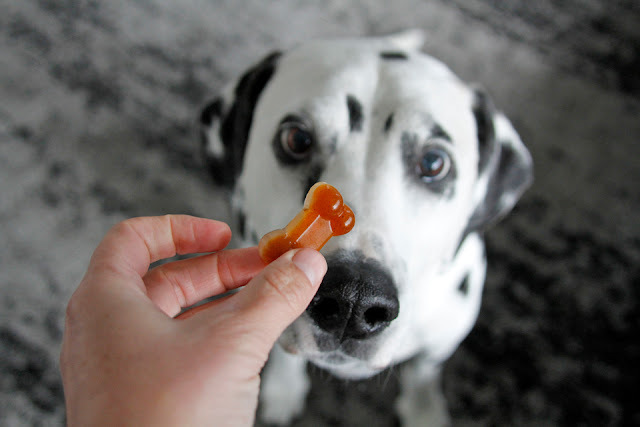 This wasn't my normal type of treat that I make...I usually make the cookie/milk bone style. 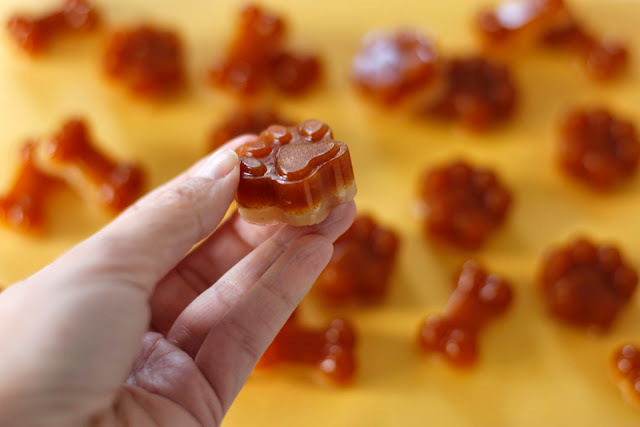 The first time I made them a gummy-style treat, it was with concentrating my own super smelly homemade bone broth, so there was no hesitation at all...hehehe... Now my boys are gummy munching monsters of all varieties and flavours.